If you’ve ever had to take a cold shower, you know that your water heater is one of the most important plumbing appliances in your home. Unfortunately, water heaters in Arizona can take a beating due to our hard water. This can lead to corroded pipes and leaks. If your hot water heater is producing water that’s too hot, or not hot enough, a licensed plumber from Chas Roberts can diagnose and repair the problem. *Should you decide to proceed with service on the day of your initial appointment, we’ll waive the $49 trip charge. 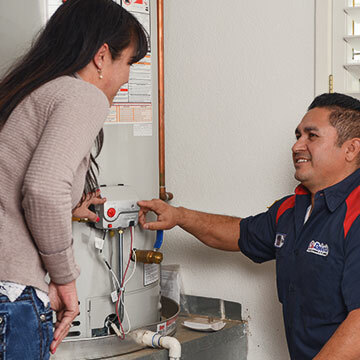 Because the city’s hard water can corrode pipes and cause leaks, water heaters need to be replaced after an extended period of time. Additionally, if a water heater is not hooked up to a proper drain, it could flood an entire garage or main floor. If this occurs, it can create lasting and extensive damage. If the damage has already been done, we can help you clean up during an emergency and correctly install a new water heater. Our goal is your satisfaction. Contact a Chas Roberts plumbing technician to ask a question, schedule a repair or maintenance, or receive help regarding a water heater plumbing emergency today.